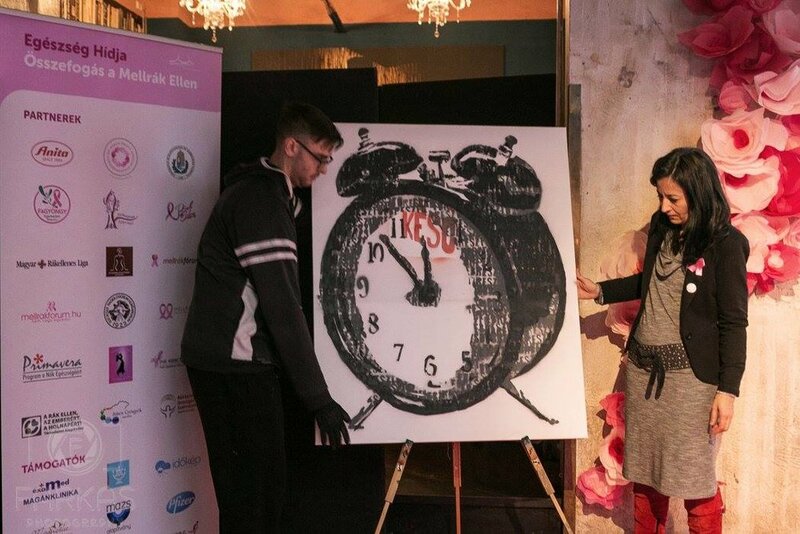 Pink Ribbons, Inc. - Pink Ribbons, Inc. - Susan G. Komen for the Cure's Foundation Hungary asked me to be the central figure around their 2016 campaign that gravitated around the importance of early diagnosis. As you may know I became a painter after losing my mother to cancer due to late medical engagement. This can not happen again. That's what mothers say when their sons and daughters go away, they say stay. She loved life so much, started hosting cancer in her body. I wasn't there when her life was leaking out on the white floor in the hospital, blossoming like roses in the snow. Our relationship was an anthem composed of words like "gotta go". And sent our regards on postcards from other places we'd been with stories about all the things we'd seen, that's how it was with you and I; why say good bye when we could still write. But then it took your hands. We should've practiced our goodbyes. I was somewhere, in the middle of nowhere watching the sun rise over a stop sign with a girl. Running back home 'cause I gotta play nurse. Gotta figure out which pill alleviates which pain, which part of your brain is being used for a boxing bag as your body became a never ending game of freeze tag, taking place in an empty playground. I was left looking for your limbs in a lost and found, and I couldn't set you free. So we just sat there. Bit by bit every day. And all I could say is if I could I would paint you some way out of this, but my gift is useless. And you said no. Paint me a picture to make me happy. Paint me a bedroom where cures make love to our cancers... But my mother just motions to a bottle full of answers and says "help me go". Smoke signalling the end of some song that I thought it would take too long to learn. Now I just sit here watching you burn away all those notes I never had a chance to play, to hear the music of what you had to say. I count out the pills just to see if I can do it. I could hook up my heart to your ears, and let my tears be your morphine drip because maybe it's easier to let you slip away than it is to say goodbye. So I hold my breath. Because in the count down to death the question of "why" melts into "when". Move brush move, paint me a mountain. Because headstones are not big enough. She smiles and says, "gotta go". Lehet az édesanyád, a nagymamád, a testvéred, a feleséged, a barátnőd, a munkatársad, vagy te magad..csatlakozz a mellrák elleni kampányhoz! Mellrák elleni felvilágosító kampány, évente figyelemfelhívó séta szervezése a rózsaszínre világított Lánchídon és az ország több nagyvárosában.